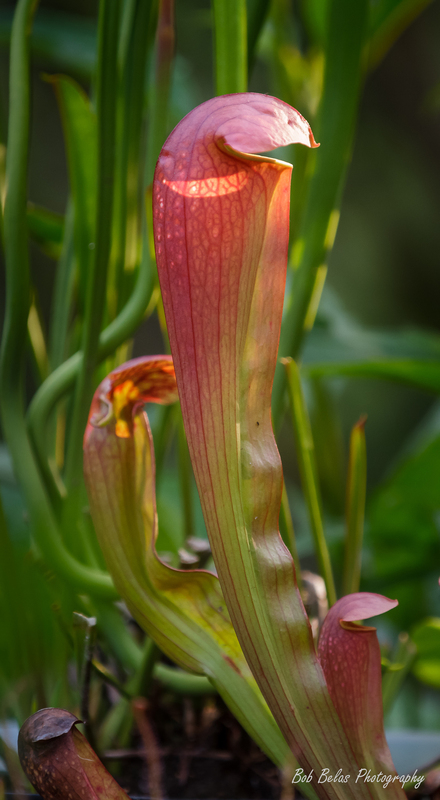 The Sarracenia pitcher plants in my bog garden have finally started to grow and produce new pitchers and flowers. I have six or seven species, all of which are native to the mid-Atlantic US. At the start of the season, which usually begins in mid-April, the rhizomes send forth long stalks with large, bulbous flowers. About three or four week later, newly formed pitchers emerge and grow, ending up in the pitcher that many recognize for its insect-capturing abilities. We in Maryland had a cold, wet Spring, so the pitcher plants are a bit late this year, but they're already catching insects! Here are the pitchers of two of the species in my bog along with one of the remaining flowers from a third variety.